I intend to get one sample for future reviews. Anyone wish to hop on the bandwagon with me? Order will be shipped out by our HaikeLite friendly store. Flashlight host is more or less the same as previous generation. 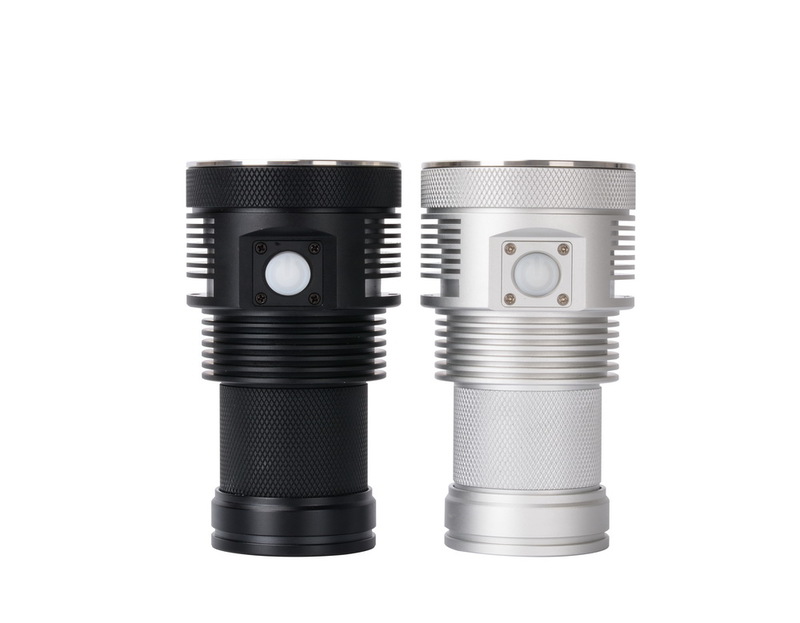 The main differences will be button and XHP70.2 emitters. Quick access to Turbo (Double click in any mode easy to access) ; Turbo can be memorized. Blow 9% power: The flashlight will flash fast and step-down to moonlight. The indicator LED will be off on Moonlight mode to extend the run time. Button seats rather low into the body, so much so that manufacturer has to pad the silicon cap with a plastic, to extend its reach for the e-switch. Although it is not a deal break, I would really hope they could enlarge the center pole of the silicon cap and extend it by another 2mm or so. New member to my HaikeLite collection. Size comparison with multi-emitters ASTROLUX MF-01 and infamous UTORCH UT03. Indicate your choice in you reply if you. Interested in price on white one with NW tint thanks! I’d be interested in one in white and NW tint. I have two of these lights already and love them. This would give me an excuse to experiment a little in some modifications of one or two of them. Any idea on approximate price for a NW one? Edit: I’ve just cancelled my order on GB, so I’m in for a NW ( preferably silver, but black is fine ). Interested in a 70.2 NW. Sorry, price is not fix. Any idea on approximate price for a NW one? Edit: I've just cancelled my order on GB, so I'm in for a NW ( preferably silver, but black is fine ). Will request for it if there is even interest. Any chance of an MT-G2 variant? Interested! White 70.2 NW please. Could we get an approximate time when we will be able to place order? PM price if you know, thank you. Was literally getting ready to order when I saw this thread, please let me know timeline so I can get one ordered. Interested only if turbo is in the mode sequence. May I ask you why ? Because with a turbo in a mode sequence, it is one more mode to have to cycle through and when you leave the turbo, you are back to the lowest mode if the sequence is from low to turbo. With a turbo by double clicking, you can turn in ON when you are in any other mode and, depending on the UI, you can return to your previous mode when you leave the turbo mode. You can go to turbo from OFF by double clicking or you can go from OFF to a memorized mode by single clicking. This type of UI is more useful IMO. If turbo has a step down, how do you reactivate turbo ? By cycling again throught all mode while it is much better by another double clicking. MT03 is a flood light. We have no plan to upgrade it to XHP70.2. So MT03 will still have XHP70 version. and the beam color of MT03 XHP70 is nicer. The 70.2 in neutral white should look fine with an orange peel reflector. It should also run cooler allowing it to stay in a higher level without stepping down as fast, longer run times as well. It’s also cheaper for anyone that wants to copy Tom E’s fet+ lumen monster since they won’t have to replace the led’s. Something went wrong with copy-paste. Interested in White Cool led. We must prove there is a demand for it. Interest in 4000k NW or warmer in white depending on price. interested in a white one with xhp70.2 in cw depending on price? Interesting choice.I don't think there are many warm XHP70 light out there. This thread seems to have slowed down really fast and the UT03 group buy thread (which is on hold) is still rolling along. I thought the possibility of XHP70.2’s would draw more interest. Is there something about the MT03 that people don’t like?